Like so many other abused elephants during the late 18 and early1900s, the five ton Asian elephant Mary was also abused by her handlers of the Sparks World Famous Shows circus. But one day she had had enough. That day would haunt the small Tennessee town of Erwin forever. Only a few days after being hired, September 12, 1916, Red Eldridge, a hotel worker hired as assistant elephant handler, lead Mary to a pond to for a drink and to splash around. On the way to the pond Mary bent down to eat part of a watermelon. Eldridge, being impatient, prodded Mary behind the ear with a hook. Mary went into a rage. With her trunk she grabbed Eldridge, tossed him against a drink stand, and stepped on his head. According to reports at that time, after crushing Eldridge's head Mary, calmed down and didn't threaten anyone. But with all the commotion everyone began to chat "Kill the elephant"! A blacksmith tried to kill her by shooting over a dozen rounds into Mary which had no effect. Word quickly grew of the incident, nearby towns wouldn't allow the circus in to perform if Mary was part of the show. Some reports indicate that Mary had killed trainers in the past and that made communities even more hesitant. 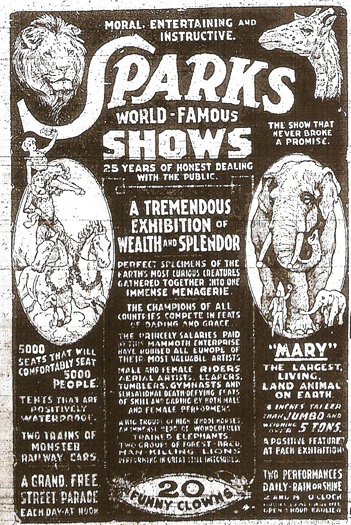 After much pressure, circus owner Charlie Sparks reluctantly decided to squelch public fear and save the reputation of the circus by publicly executing Mary. On a foggy and rainy September day in the nearby town of Erwin, Tennessee, a crowd of over 2,500 people gathered at the Clinchfield Railroad yard to watch the execution of Mary. 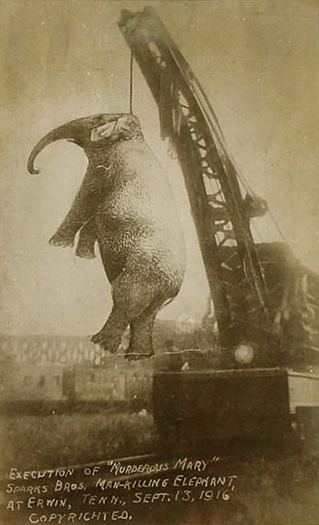 The elephant was strung up by her neck with the use of a chain connected to a railcar-mounted industrial crane. As she was hoisted up the chain snapped and Mary fell, breaking her hip. Many children watching the spectacle ran in terror. Finally with a heaver chain the second attempt was successful in killing Mary. She hung for half an hour until she was declared dead. After the execution Mary was buried next to the tracks and she was known as "Murderous Mary". 95 years later the residents of Erwin, Tennessee would like to move past the strange event that has haunted their town. 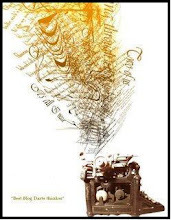 But many are still intrigued and keep this historic event alive. An antique shop named "Hanging Elephant Antique Shop" opened in Erwin memorializing the event. There you can purchase tee-shirts with the image of Murderous Mary hanging from the railcar crane.